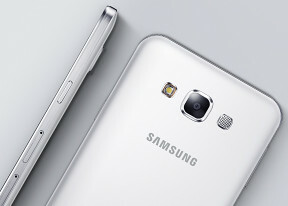 The Samsung Galaxy E7 has strong reception and the in-call sound is loud. The dialer is the familiar TouchWiz app and features all the basics - smart dial, quick dial and even a video call button. When calling someone (or they are calling you), the phone will remind you when you last spoke. If you're using both SIM cards, you can enable and disable individual cards and toggle the Always On feature. Say you're talking on one card and someone calls you on the other, normally they would get a message that you're out of reach or your phone is switched off. With the feature enabled, the second card will forward the call to the already active one and you'll receive a notification of the incoming call, while the other party will be informed you're busy, instead of out of reach. If you actually pick up the call, forwarding charges between the two cards will be incurred on your bill. You can pick which card is used for voice and video calls and which SIM provides the data. SIM2 is limited to 2G only (slow data and no video calls), but that's irrespective of the cards' actual placement in the slots, and is a software setting instead. We ran our traditional loudspeaker test on the Samsung Galaxy E7 and it performed much like the Galaxy A7. It managed an Average score, but has potential to be quite loud with the right ringtone. It shouldn't be a cause for missed calls in all but the loudest environments. The Messages app gives you a row to fill with the most important contacts, up to 25 of them. It displays messages grouped into threads and handles both regular texts and MMS messages. On a dual-SIM phone there are two Send buttons so it's easy to use either card. The Galaxy A7 comes with two email apps - the ubiquitous Gmail and the Android Email app. It supports multiple accounts and has a reasonably modern UI, but since the Gmail app gained support for third-party servers we prefer it overall. The Samsung keyboard offers an extra number row, which can be used to insert pre-written phrases by longpressing a particular number. You can use swipes on the keyboard to move the cursor or as an alternative to tap typing. There's no secondary symbols upon longpressing the letter keys, a longstanding shortcoming of Samsung's keyboard design, which may or may not bother you in particular. A small floating keyboard is available in addition to the squished one-handed keyboards. There's intelligent predictive text feature that can learn from your messages (even your contacts' messages), your email and your social networking accounts. These are disabled by default and need your permission to activate.